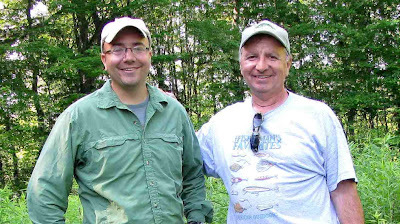 About a week ago, I had the opportunity to meet up with Tom aka "The Fishing Guy" at Kent Bog State Nature Preserve. I made a quick check of the bog and updated a few rare plant records. We had a great time looking at the tamaracks, sedges, and other bog plants. For more, check out Tom's post of our meeting. Have a fantastic and safe holiday weekend. I always wanted one of those TomToms! I was a great post and I highly recomend a visit! One of my favorite spots and very close to my parents house. Did you see any of the interesting herps that inhabit the bog? How neat that you guys met. I like Craig's comment..LOL!